I look around the familiar park where I have spent many a weekend afternoon. Often, I would visit here by myself, taking a mostly-silent walk along this blacktop path. It is a miles-long trail going past the Raritan River, the tiny zoo, and the picnic areas. I glide past soccer games and nearly tame Canadian geese. I often have nothing in particular to do here, but today is a day of great activity. It is the 5th Annual Hands of Change Pagan Picnic. Hands of Change is an eclectic Pagan group dedicated to spiritual growth, fostering spiritual community, and promoting healing change in ourselves, our wider communities, and our world. We honor all nature and respect all loving spiritual paths. We recognize divinity in many forms, both masculine and feminine, as the Goddess and the God. Today is the yearly event that brings together over 150 people in this very public outdoor space for worship, workshops, sharing, and celebration. I am upbeat on this busy morning, and a little nervous. This is the first time I will be co-leading a workshop on kirtan chanting. It will be the first time I bring Krishna, and myself as a Krishna devotee, to my community. I was touched by Sri Krishna last winter. Exactly why or how, I cannot say. I can say that it was by way of direct spiritual experience. I can say that in early December I was changed, somehow made new. When I sat alone, I began to perceive a powerful, inner voice resonating, expanding. I sensed a loving, spirit presence around me unlike any other I’ve known. I have been an intuitive for most of my life- so for me, perception of those on the other side of the veil is not as foreign or bizarre to me as it may sound. But this was definitely different. I was greeted by a kind soul, who took me to this new heightened energy, and truly, to my new life. Spirit grew inside me; I began to see- in the deep sense of the word- more clearly. The next thing that happened is something that I have just barely tried to express in words before. It was as though my mind and soul opened up and I received something- something more essential than anything I’ve ever encountered. It was a spiritual awakening that found me in my home for several days, experiencing Light, Love, and Joy. It is not something that can be rendered in exact translation; all I can say is that the Light is beautiful, nearly blinding, and it is ecstatic. Though I have generally been sensitive to the subtle energies around us all, this time my chakras- especially the 7th- felt stretched almost beyond capacity in a wild, loving, draining, constant experience. After a while, the energy flowing around and through me continued at all times, regardless of my activity. I began to hear words and experience visions of Universal Love and inspiration. It was hard not to feel insane, but ultimately I was sure I needed to stay with this psychic opening. I knew that what I was encountering was the Permanent, the All. Somehow I was made open enough to recognize and receive the Truth and Love that is always there for us. I listened, and I came to know that Permanent thing as Krishna. It seems as though after that experience, my mind is so much freer and wonderful things have happened in my life. I have become all the more dedicated to my work in music, and to being honest about my deep spiritual path through my music. Though I had done some kirtan in the past, this devotional chanting is now a vital and indispensable part of my spiritual life. Mantra has become a part of my songwriting and performance now. So many other doors have opened up for me, both subtle and obvious. At nearly the same moment of the joy, though, came the fear: What is happening to me? Have I gone mad? Many of my Pagan sisters and brothers who worship and understand the ethereal when it happens “somewhere else,” just may look askance at my wild stories of direct connection with God. I can’t tell them. No. Never. At least not so clearly. I have to deflect it, depersonalize it. I am afraid of the crushing weight of stereotypes – Will my friends think I’ve joined a cult or have become some kind of freak? Maybe I should make the jokes myself-- Do I worship a God who requires me to dress funny and bother people at the airport? And why does God come to me now? Why not the Goddess? Why hasn’t Spirit come to me in the form of the beautiful Lakshmi, Saraswati, or the fiery, wrathful Durga? Have I run headlong into embracing a major religion full of patriarchy? I am angry that it happens this way. And I am really, really scared. I am seeing the Universe. 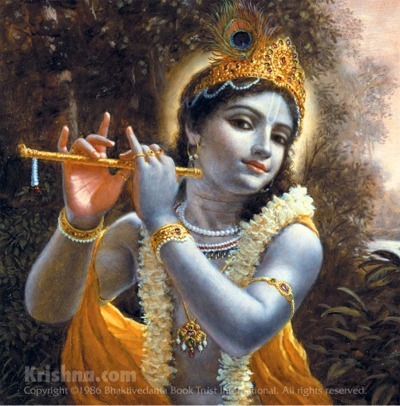 Perhaps Krishna has manifested in our understanding through the physical as a carefree blue guy playing the flute. I can make no mistake, though, that what I feel is the All- an endless swirl of energy and consciousness so far beyond gender that such differentiation has no relevance. Krishna is my personal, primary point of entry to where all the beautiful representations of Goddess and God exist together in one bright flash. I’ve been closer to that flash now, than I’ve ever known is possible. How can I ever come back from this moment to be with friends, to work, to live… like before? Nothing will ever be like it was before. I am changed. The pure Love is the most precious gift that has been given to me in this intense life-moment. Love is an abstract; the best we can do is to create struggling metaphors and similes and hope the message is conveyed. My love for Sri Krishna is so all-encompassing, that in those moments it is like the most intense falling in love experience that you have ever encountered. It is wild and passionate and fervent. The sheer intensity of this Love is frightening in its very moment; it is frightening-amazing-enlightening that I can feel anything this deeply. It is as if I might disintegrate, lose my mind, or simply disappear. Maybe that’s what it’s all about- getting to that place where the self is completely absorbed into God and the Dharma of Oneness is revealed. I had never realized before that this same experience may be approached through devotion to Deity as well as through the method with which I was always more familiar- silent meditation. Many paths, many gates, many Names. I honor them all. I am bringing Krishna to the Pagan community now. I’ve never felt so truly excited about an enterprise. Though the fear sometimes arises, I have let much of it pass through me. I keep moving. I am so in the midst of the process of my own learning, and at the same time I am happy to teach mantra and kirtan singing where and when I can. To feel others’ natural gravitation toward the practice is a blessed reward. The feeling soon fades away and I am moved by the sweet voices that respond. The people line up slowly, and each places a single flower bud on the altar in honor and connection. It is witnessing the faces of the people that floors me- I see so much sincerity. I see honest opening. I see their lips moving in their moment of meeting the Divine Energy, all the while to the song of the Holy Names. I see faces changing, tears in eyes, and all the while we sing. We sing of the coming to God for no other motive but to be one with that Love. In each beautiful face, I see the deep simplicity, and I know just how much all this matters. 1 “Govinda Hare” on Pilgrim Heart album by Krishna Das, Mustamullah Music (BMI) 1998. Distributed by Razor & Tie Direct LLC, P.O. Box 503, Village Station, New York, NY 10014. OM GAM Ganapatiye Namaha! OM DUM Durgaye Namaha! Devi Spring, author and compiling editor. Copyright Devi Spring 2006.